Happy 4th to you all! In between all the beaching, swimming, barbecuing, and Fourth of July parading this long weekend, I'll be cracking open this raved-about novel, sampling recipes from my new favorite cookbook, and lounging around in this newly purchased bikini top. 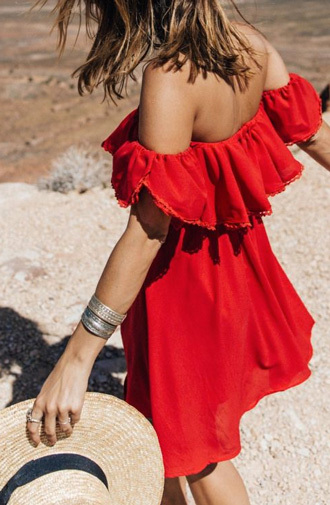 I'd also like to while away the holiday with these stylish 80-degree staples: a pair of Le Specs mirrored sunnies, an off-the-shoulder Mango dress (similar to above), glimmery-glam K.Jacques sandals, a Janessa Leone straw hat, and a chic skin-baring beach-to-BBQ Zara top. Such a cute outfit! I'm leaving for vacation and am buying the Le Specs sunnies and Zara Top...Today! The dress is on fire! Really nice! The dress is wonderfull great job! That Zara top you linked... So Tibi! Love!